I’ll start this blog with pure transparency. I have a special needs child and disability issues are something that I tend to fight about. 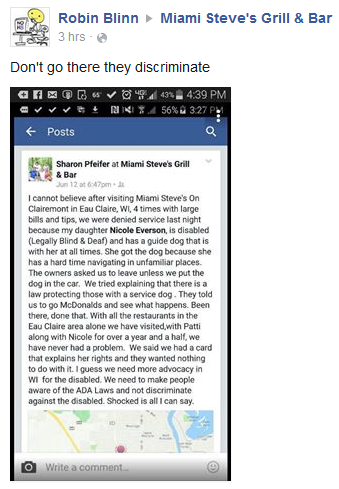 With that out of the way, what is happening now with a restaurant in Eau Claire is a perfect example of how to let online reputation management or lack thereof destroy your business. The last post was March 31st. This poses numerous problems with your social media management, but also shows you just don’t care about the marketing platform. 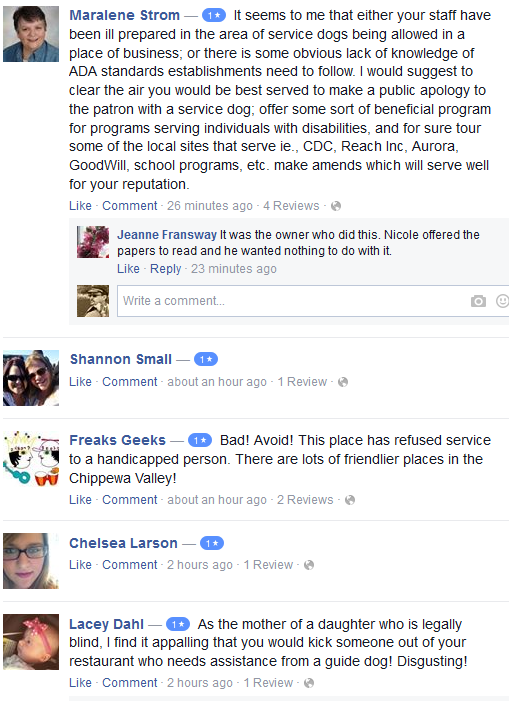 Now, you have more than 20 comments on that post calling you out for the service dog issue. 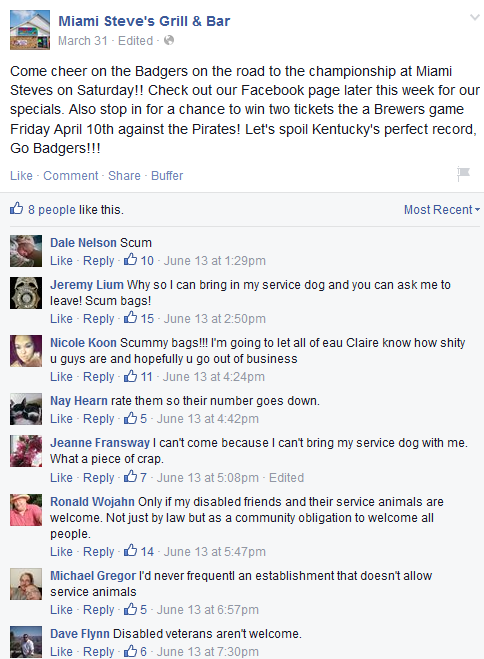 Even worse, it’s a post about the Badger Basketball team’s Final Four appearance! Go to the posts below that and you see people commenting on those as well! Your engagement is now going up and more people are seeing this and are becoming outraged. There has to be some sort of response from management as this is quickly spiraling out of control. 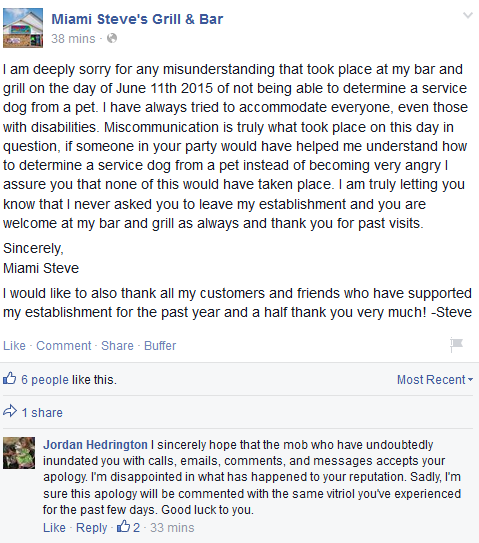 Posts to the page have now cropped up and the mother of the person this happened to checked into your establishment on Facebook, made the post below and began this viral issue. Not getting into the specifics of what occurred, you now have PR nightmare that isn’t being handled properly. You even have a competitor stepping in and now that competitor is getting GREAT PR! 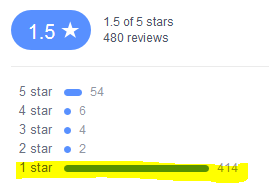 Finally, your reviews have skyrocketed but not in the way you would want to happen. Bad reviews on Facebook, like Google and Yelp, are business killers. There is an easy way out of this: use your Facebook page to apologize, offer an explanation, offer the family denied service some sort of compensation. If this did not occur, then DO SOMETHING ABOUT THAT. Make sure people know about it. 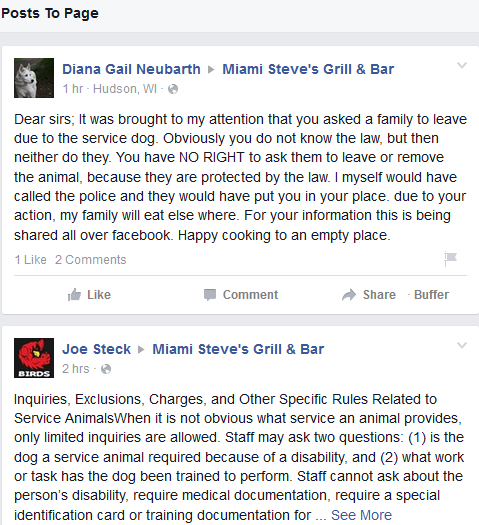 But, be aware, a law was POSSIBLY broken and now this customer could turn their night out with denied service into a lawsuit that you might not recover from. Ignoring a social media firestorm is a bad move. This won’t go away unless you become proactive. Now is the time to do so. 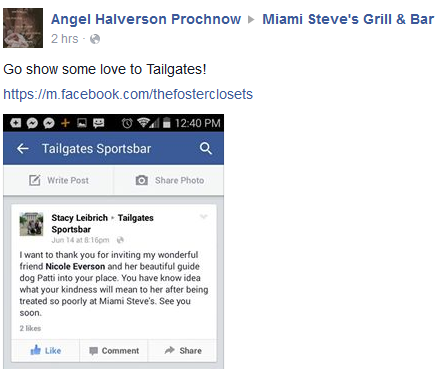 The owner of Miami Steve’s did issue an apology after this blog was posted. You can read it below. At least there’s an attempt at amends. Filed under: Social Marketing, Social Media.